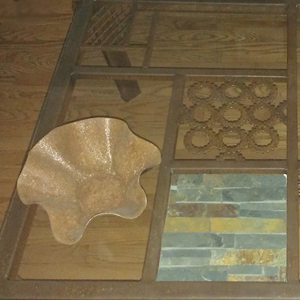 This mixed media table is constructed from steel, iron, granite, slate and glass. When started, it was intended to be wall mounted. But because it didn’t feel right, I let it sit in my garage. A year later it struck me that this would make the base for a table. This is an example of my work process which allows a piece to evolve slowly.